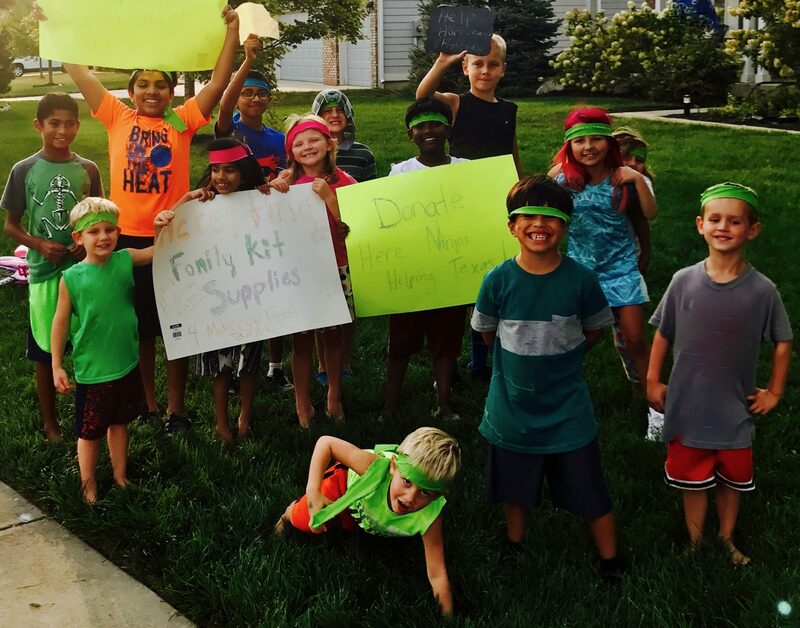 Lindsey Fella Berry, The Helping Ninja Mom, is a contributing writer to the Indianapolis Moms Blog. “The Raddish Story” is a true-story, about the Helping Ninjas and their school cafe garden. 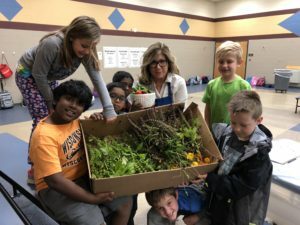 Susan Eva-McCord is the cafeteria manager at one of the schools many helping ninjas attend and her passion for farm to table inspired Helping Ninjas to learn how to grow organic food from seed and the importance of edcucating others how to do so. Helping Ninjas was built on the idea that others should learn how to help our planet and how to help ourselves and each other. Learning about the importance of pollinators, healthy soil, organic fertilizers, composting, water conservation, recycling- all of the things that help protect nature, are helping us too. Eating nutritous, fresh foods that are plant based is important, and learning about what eating vegetables and fruits, and what they each can do for health is something we hope to teach others. Learning about foods and their super powers shows us that, science is cool. When a helping ninja mom met Susan, they discovered that they shared the same similar visions for children, a healthy one. Both sharing the enthusasim to help children learn how to help themselves and our planet. Her vision of farm to table for shcools inspired this helping ninja mom to want to learn and to provide opportunities for children and others to learn too. The importance of fresh food from the garden. I have worked at in the school food service industry for a little over 10 years.I began working at a high school in Food Service. A close friend worked there and encouraged me to apply since the last of my four children was in the process of graduating and heading off to college. I liked working in Food Service right away. I enjoyed discovering new ways of cooking and how the diet has a definitive effect on health and behavior. It was during this time I read an article in the Indianapolis Star about schools in California growing their own food. I believe they called it “’the edible schoolyard’”. I thought, “we could do that within the school district I was employed.” I soon noticed while working at the High School a Green House on top of the school which was no longer being used. My supervisor gave me permission to visit other schools who had implemented Greenhouses in their schools. I visited Canterbury School in Ft. Wayne, Indiana. This school’s greenhouse was used as part of their Science Curriculum and I was very impressed. I returned to Food Service with a new passion and drive to see what we could accomplish at within our school district. Shortly after this, I applied for a grant with the Indiana School Nutrition Association and won! This grant afforded me just what I needed to attend Purdue University and earn my Nutrition Degree. Upon graduation I was offered a job managing Food Service at an elementary school. Right away I met with the principal to request growing food for our children. My principal, in her wisdom recommended we try growing food first in the School District’s Community Garden. We did, and right away the High School Food Service Manager saw the importance of this and decided to come on board. We planted peppers, tomatoes and lots of basil. It was a learning experience for sure. We definitely learned what the lack of or surplus of rain can do to a crop! We used what we grew in the high school cafeteria. After this, we began using the produce in the middle school. The cafeteria manager at the middle school, where the garden is located, implemented an after school Food Club and now we not only had the managers hand helping but the students as well! Eventually other faculty saw the importance of this and offered their student’s environmental science class usage of the garden. Several high school students planted vegetables which were also used in the cafeteria. As what often occurs, many of the managers moved onto other endeavors but of course with any passion, it does not burn out, it becomes redirected. The students at the elementary school in which I was employed had the opportunity to travel on many field trips to the School Community Garden, and under our principal’s supervision we decided to allow the first grade students to plant the seeds they were growing in their classroom to be transplanted on their field trips and be used in the cafeteria! The students grew tomatoes, peppers and basil. The tomatoes and peppers delivered by our parent volunteers to almost every school, hoping to promote awareness of what could be done! The basil was harvested and pesto was made and introduced on the school’s cafeteria salad bar with a Pesto Chicken Recipe. Most recently, our cafeteria was the recipient of a donation of a grant award, in which our students were awarded from a Micro Teen Green Grant that their not for profit collaborated on a project that would help support our school’s farm to table goals establishing an outreach project that would promote a green community and green school, and create awareness about our garden. Organic gardening methods were used to creating opportunity for elementary students to experience hands on learning —to grow from seed & help to care for the gardens and engage on four cafeteria plots in which I managed, and were also given the chance to help harvest and share with our community. This spring, I have been granted approval and permission to install a school cafe garden on school grounds at the elementary school, in which I will be able to continue my enthusiasm and perseverance of farm-to-table goals within our schools. I am so very excited to have the opportunity to offer fresh, local produce to the children and hope to see these opportunities continue to grow. While at Purdue I learned much, but one thing which always stays with me, especially in today’s culture of fast and processed food, is the higher the nutrient content is in a food, the greater capacity the food has to help the brain and body function. What a great opportunity I have been given and to lead the students by teaching them how to grow their own food, a sustainable skill which we hope will be shared with many more generations to come.